Lately, this is what we've been hearing, coming down our chimney and serenading us, unbidden. If you live anywhere in North America, you no doubt recognize the random stylings of Mimus polyglottos, otherwise known as the Northern Mockingbird (although the georeference seems superfluous since there's no Southern, Eastern, or Western Mockingbird). The mockingbird is the state bird of Texas (and also of plagiaristic, lesser states such as Mississippi, Arkansas, Florida, and Tennessee). 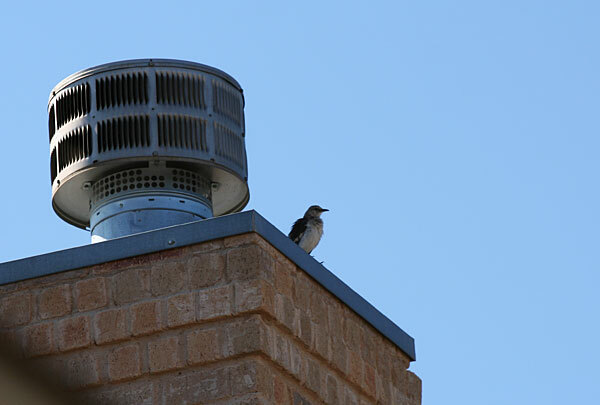 I'm not opposed to having a songbird share his musical gifts with us, but I became curious this afternoon as he competed with the soundtrack of the mindless movie we typical nap to on Sunday afternoons, and I wondered just what it was he found so attractive about our chimney. Was there a nest up there? Was he teaching his young offspring how to sing? Male songbirds tutor their young on how to produce the distinctive songs of their species in a sophisticated process that may help to explain how other animals, including humans, learn complicated skills. Darwin called birdsong "the nearest analogy to language." Indeed, song-learning in birds turns out to have striking similarities with how humans learn speech, from the process of listening, imitating and practicing all the way down to the brain structures and genes involved. Armed with the knowledge of this theory (my usual substitute for any actual knowledge), I envisioned dad holding forth to a bevy of attentive younguns, eager to emulate his own emulations (they're not called "mockingbirds" for nothing). My curiosity aroused me from the comfort of my recliner, and I climbed onto the roof in search of the nest that I was sure kept that bird coming back to the same spot day after day. Of course, there was nothing up there, other than the shade of the chimney vent, that apparently being a sufficient platform for his vocal gymnastics. My disappointment at not being able to confirm the avian-dad-as-teacher theory was tempered by the good news that we won't have to endure an amplified group singalong by a whole bevy of birds. But here's one thing to keep in mind: if you want to keep a secret, don't share it in the general vicinity of a chimney, because it makes an awfully efficient microphone. This page contains a single entry by Eric published on June 19, 2016 6:16 PM. Captured by The Highwaymen was the previous entry in this blog. Ballroom Dancing in the Hill Country? Yes, it DOES exist! is the next entry in this blog.